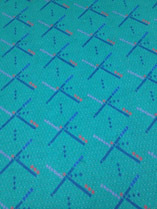 Portland is often considered a hipster mecca, and long before there was Portlandia, there was the Portland Airport Carpet. In the 1980’s, the Portland airport, known as PDX was renovated. One major installment during this renovation was new carpet. A local architecture and design firm was hired to design the carpet pattern, and what they came up with is what is now known as the iconic PDX carpet. Fast forward about 20 years later, and it was time to start replacing the not yet famous carpet that was beginning to fray. As new carpet began replacing the original carpet, Portlanders took notice and started taking photos of themselves with the carpet. A social media trend went viral as people started posting pictures of their feet on the carpet whenever they were at the airport leaving town. The new carpet has slowly started to replace the old carpet and Portlanders are not pleased. Part of what makes the carpet so iconic is that soon enough it will be gone forever and there will be nothing left but the photo evidence, much like a childhood pet. Will the new carpet draw as much attention as the old one, or will the hipster Portland scene forever feel betrayed by their beloved airport?